2009 Arctic Cat Atv Prices. Easy to Read Quick Reference Guide. 2009 Arctic Cat ATV Prices. 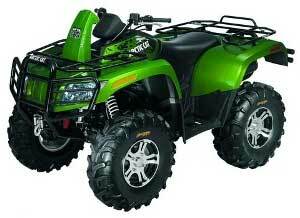 Our quick reference guide of 2009 Arctic Cat ATV prices lists all the models for 2009. Since times are tough right now, Arctic Cat is offering some special deals, rebates, and low cost financing. Several dealers we checked are knocking a few more dollars off these listed prices to help get you on an Arctic Cat ATV. List of 2009 Arctic Cat ATV Prices. Arctic Cat is doing everything they can to help get you on an ATV. Check with your dealer on current rebates and discounts from the 2009 Arctic Cat ATV prices. This may be the best time ever to find a deal on a new Arctic Cat. Check out the Arctic Cat ATV Guide for more info. Click here for the full 2009 Arctic Cat brochure. For used Arctic Cat ATV prices, there are a couple of good guides to check. The NADA Guide and the Kelly Blue Book. They both have a list of available options so it's easy to see how much those add to the price. The NADA Guide is the easiest to use, but the Kelly Blue Book is still the most popular. It's not a bad idea to check both guides just to compare the prices and use them to figure a good price bracket. Click here for NADA Used Arctic Cat ATV prices. Click here for Kelly Blue Book used ATV prices. Arctic Cat Mud Pro. Videos, pictures, specs, and more in this exclusive review. Arctic Cat Four Wheeler Prices. These Arctic Cat prices for 2012 are a quick reference guide of the suggested retail prices of new models. Arctic Cat Guide - More ATV info. World of ATVs Home page from 2009 Arctic Cat ATV prices.